Air conditioners are used for reducing the ambient temperature and they are manufactured in different versions. Especially, split type air conditioners are used widely. Because of increasing use of air conditioners, energy consumption has also increased, so researchers have attracted to search for production of more efficient air conditioners. The main objective of this study is to investigate thermal performance of the whole split type air conditioner system. For this purpose, an experimental system was designed and manufactured by adding a boiler unit to the conventional split air conditioners condenser. At the end of the study, coefficient of performance (COP) of the system increased from 3.64 to 4.54. In addition, boiler which added to system increases temperature of water from 10ºC to 40 ºC. When economical benefit is considered, electrical consumption is decreased 0.61 $ supposing that the device works 10 hours in a day. Only 132.5 $ is paid for the device in addition to existing split air conditioners. Besides, domestic water at 40 ºC was produced. T. Menlik, A. Demircioğlu, and M.G. Özkaya, “Energy and Exergy Analyses of R22 and its Alternatives R407c and R410a in a Vapor Compression Refrigeration System”, Journal of Exergy, vol. 12 (1), pp. 11-30, 2013. [A. Ergün, T. Menlik, T. and M.G. Özkaya, “Energy and Exergy Analyses of the Heating System in a Multipurpose Building”, Gazi Journal of Engineering Science, vol. 1, pp. 195-218, 2015. A. Ergün, T. Menlik, T. and M.G. Özkaya, “First and Second Law Analysis of Central Cooling System of a Multipurpose Buildings”, International Symposium on Innovative Technologies in Engineering and Science, vol. 12(A) pp. 1974-1983, Karabuk Turkey. 2014. A. Ergün, “Energy and Exergy Analyses of a Shopping Center Which Needs 80.000 M2 Heating and Cooling”, Master Thesis, Gazi University Graduate School of Natural and Applied Sciences, Ankara, 2010. P. Martínez, J. Ruiz, C.G. Cutillas, P.J. Martínez, A.S. Kaiser and M. Lucas, “Experimental study on energy performance of a split air-conditioner by using variable thickness evaporative cooling pads coupled to the condenser”, Applied Thermal Engineering, In press (doi: 10.1016/j.applthermaleng.2016.01.06.) 2016. K. Sumeru, S. Sulaimon, H. Nasution and F. N. Ani, “Numerical and experimental study of an ejector as an expansion device in split-type air conditioner for energy savings”, Energy and Buildings, vol. 79, pp. 98–105. 2014. A. S. Padalkar, K.V. Mali and S. Devotta, “Simulated and experimental performance of split packaged air conditioner using refrigerant HC-290 as a substitute for HCFC-22”, Applied Thermal Engineering, vol. 62, pp. 277-284, 2014. D. Kumlutas¸ Z. H. Karadeniz and F. Kuru, “Investigation of flow and heat transfer for a split air conditioner indoor unit”, Applied Thermal Engineering, vol. 51 pp. 262-272, 2013. J. Jia and W.L. Lee, “Experimental investigations on the use of capillary tube and thermostatic expansion valve in storage-enhanced heat recovery room air-conditioner”, Energy and Buildings, vol. 101, pp. 76–83, 2013. J. Jia and W.L. Lee, “Experimental investigations on using phase change material for performance improvement of storage-enhanced heat recovery room air-conditioner”, Energy, vol. 93 pp. 1394-1403, 2015. ISNAD ERGUN, Alper . "Evaluation of Commercial Type of Split Air Conditions by Using Condenser Waste Heat in a Boiler". 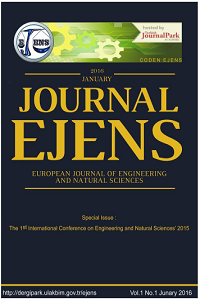 European Journal of Engineering and Natural Sciences 2 / 1 (February 2017): 188-193.